A resident visa is a visa that will allow you to stay in New Zealand indefinitely. You may live, work and study here. You may even set up your own business. 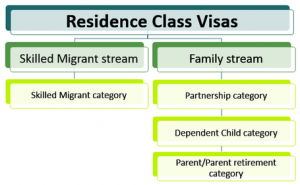 There are several subcategories of residence class visa. The 2 most popular streams are the Skilled Migrant Stream and the Family stream. You may qualify for a visa under the Skilled Migrant Stream when you have qualifications, work experience and, even better, a job offer in an area which is in demand in New Zealand. A Family Stream Visa may be the right option for you when you have a partner, parent or adult child who lives in New Zealand as a citizen or permanent resident. A lot of people want to live and work in New Zealand permanently. The majority of people who want to come to New Zealand will have to take a detour to reach this goal. A common pathway to residence is to start with either a student visa or a work visa. By choosing your course of study carefully and after you may qualify for a post graduate work visa once you have completed your study successfully. You may be granted an initial 1 year job search visa and a subsequent 2 year work visa may follow if you have secured a job that relates to your study. You may either move on to an Essential Skills Work visa or apply for a Skilled Migrant resident visa if you meet the requirements. There are a lot of questions about the difference between a Residence visa and Permanent Residence visa. In most cases you will be granted a RESIDENCE visa. This means you may, when granted entry permission, remain in New Zealand indefinitely. But when you leave New Zealand, to go on holiday or visit family overseas it is not a given you will be granted entry permission when you return to New Zealand. This depends on the travel conditions that are on your visa. A Permanent Residence visa holder may remain in New Zealand indefinitely AND when they have left New Zealand they will always be allowed back into the country. You may be given a Permanent Residence visa after you have been in New Zealand for 24 months and have met one of five specified conditions.